The Weedy Sea Dragon, not to be confused with the Leafy Sea Dragon, at Georgia Aquarium is one of the most difficult creatures in the entire facility to photograph. They're constantly blinking! Oh wait, that's not it. They're constantly moving...yea, that's right, they're constantly moving! They're absolutely fascinating creatures, too. Of particular interest, the Leafy Sea Dragon is a close relative to Sea Horses (also housed at Georgia Aquarium), the male births and broods the offspring, and they're poor swimmers, which may be a contributing factor as to why it took so many months for me to get a relatively decent photograph. 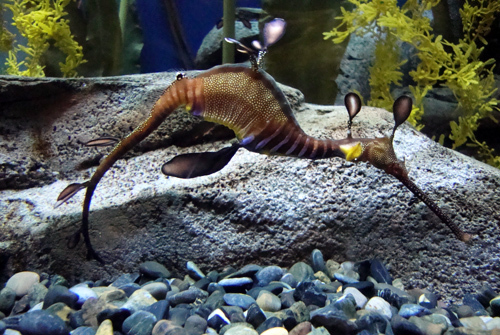 Want to see Atlanta's Sea Dragons, which are from Australia? Head over to Georgia Aquarium's Cold Water Quest gallery and explore, explore, explore!